This study highlights the findings of researchers who, since the early 1980s, recognized the potential of engaging seniors in game interactions as an alternative to passive activities. Against this background, the perspective of anticipatory processes for evaluating specific gaming needs of the aging and providing games with anticipatory features is introduced. The hypothesis informing this work is that aging results in diminished adaptive abilities, resulting from decreased anticipatory performance. To mitigate the consequences of reduced anticipatory performance, we address brain plasticity through playing. Since anticipation is expressed in action, the games conceived, designed, and produced for triggering brain plasticity need to engage the sensory, cognitive, and motoric. 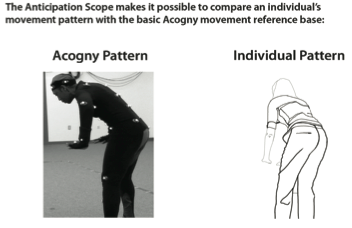 The AnticipationScope, i.e., integration of motion-capture data and physiological sensors, is the platform for identifying individual characteristics and for validating the results of game participation. The output is the Anticipatory Profile. Implementations inspired by this original scientific framework are presented. The year was 1958. William Higinbotham, working at Brookhaven National Laboratory, conceived of a tennis game consisting of a Systron analog computer, handheld commands, some relays, and an oscilloscope. Simulated on a screen was a side view of a tennis court. The two players could rotate a knob that changed the angle of the “tennis ball,” or press a button to send the ball toward the opposite side of the virtual court. If the ball hit the net, it rebounded at an unexpected angle. If the ball went over the net, but was not returned, it would hit the court floor and bounce again at a natural angle. Since this was an analog computer-based game, the ball sometimes disappeared from the screen. A Reset button could be activated, causing the ball to reappear and remain stationary until the Hit button was pressed (Brookhaven National Laboratory, 1981; Ahl, 1983). Today, games for health, and in particular games addressing the rapidly growing aging population, represent a large segment—evaluated at 26%—of the entire effort to conceive, design, produce, and market games of all kind. One of the games used in this effort—Surprise! Surprise!—is tennis. And one of the most important observations made so far is that playing tennis with the computer is interesting at the beginning. However, playing with someone else, for instance, over the Internet, is what users want, regardless of whether they are beginners or those handicapped seniors who once upon a time used to play real tennis every day. The social aspect of playing is actually more important for the aging than for any other demographic group: “Games will entice the aging to remain fit and mentally active, to connect with others” (Montet, 2006). During the 50 years that have passed since Higinbotham conceived his game, many more observations have been added to the one regarding the social nature of human interactions through games. In our days, there are many attempts to make games, usually associated with entertainment and therefore compared to the success of Hollywood. In the meanwhile, games became part of the awareness of the medical community (after being successfully adopted by the military, by education, and even by politics). There are competitions—in the USA alone, over 30 posted on the Internet in 2008—funding opportunities (associated with the NIH, NSF, AASHA/CAST and several private foundations), classes offered in various settings—from training sessions to Ph.D. studies. As far as medical applications are concerned, there are many research activities, ranging from addressing obesity in the young (and not only), to PTSD, autism, cancer treatment, etc. The body of scientific contributions in peer reviewed journals has increased spectacularly over the last five years. Many journals—from Nature and Neuroscience to Science—report on progress in understanding the various aspects of a game-oriented culture, and in particular of game adoption by healthcare professionals. The number of experiments dedicated to the extremely important issue of game impact validation doubled in the last three years. Indeed, to have a good time with a game is not really dependent on what various experts measure: How fast do you get bored? How long until you abandon the game? What gets your “juices” running? and so on. Experts continue to measure such characteristics anyway—because this is how funding can be secured, and because the game industry wants numbers for marketing purposes. Since the game industry is extremely competitive, but also very impatient, even a little knowledge (as dangerous as it can be) is considered better than none. But once you project expectations related to health, the name of the game (pun intended!) changes. As a matter of fact, a game for health—for young or old—will be judged almost like a physician is. Forget liabilities for a moment—which have already attracted the attention of lawyers and public advocates. The promise implicit in any treatment entails the necessity to produce the data validating the promise. Moreover, from casual games to massively multi-player online role playing game (MMORPG), what drives the effort in the first place is art and design, combined with good computer knowledge, extending into artificial intelligence and virtual reality. Once a certain game platform is made available, technological considerations are translated into game opportunities. Technological progress—faster processors, new forms of interaction, better interfaces, better I/O devices, etc.—have led to new game platforms. And this translates into opportunities. This is true also in respect to games for health. Consider only the impact of Nintendo’s Wii platform on new game developments taking advantage of more intuitive forms of interaction. What in the first place drives the effort in the area of games for health is medical knowledge. This knowledge tends to be specialized: brain science, physiology, cognitive science, gerontology, etc. Not surprisingly, game companies tend to secure ownership rights over such knowledge as a way to maintain competitive advantage. Published science might be in the public domain, but when science needs to be translated into game specifications, proprietary solutions are usually the result (for example, Posit Science). At the meeting point of high scientific competence, innovative game design, and technology development—often requiring new means and methods for game interaction, art and design, and feedback monitoring—not only engaging games, but also means for evaluating their usefulness and attractiveness are expected by the public. The major difference between any other type of games—including those designed for training— and the category lumped under the label “games for health” is that without scientifically based validation, such games compete with traditional medical care, but without offering to people in need of alternatives any proof for their effectiveness. Validation is also important in the competition among the many products claiming their share of the market. So far, games remain the equivalent of over-the-counter products—some more convincing than others, and the majority not qualifying for medical insurance coverage. The aging, in particular, are likely to fall prey to the latest crop of snake-oil peddlers operating in the gray zone of hope against resignation. With 1958 as a reference point for games themselves, let us look at some of the earliest attempts to associate games with health and the many aspects of addressing the particular needs of the aging. Way back in 1976, efforts were made to involve the relatively small population segment of the aging in computers (Jaycox & Hicks, 1976). Interestingly enough, it was the interaction with students, i.e., young people, which proved most stimulating for the elderly, not their exposure to computers. So far, nothing unexpected—games or not, interaction with the young always helped people facing the many debilitating effects of aging. Slowly, in the course of events, the subject changed and the focus shifted to self-learning and self-sufficiency (Hoot & Hayship, 1983). In this context, Weisman (1983) reported on modified computer games made available to a group of 50 nursing home residents. The study was conducted with the help of the Georgetown University School of Medicine and involved games such as Little Brick Out, Ribbit, Country Driver, and Hangman. Evidently, one should not even try to compare the research possibilities of the 1980s (the last century, imagine that!) to the technology of our time or the challenges we face in addressing the various roles games can play in the lives of a rapidly growing aging population. Still, it is encouraging to see how far ahead the thinking went in respect to the possible impact of games. Even game addiction was brought up at that time. Now fast forward to this century—already ten years old—and you will notice that one question lingers: “Video games for the elderly: an answer to dementia or a marketing tool?” The Guardian (McCurry, 2006) and The Examiner (Barker & Bernhard, 2008) quote my own work on games and the aging (“…the best ones ?are those that require players to be active and to socialize with other players”), together with the work of other researchers on the subject. There is no reason to compare Little Brick Out or Ribbit (mentioned here for those few who might still remember them) to Guild Wars, played Sandra Newton (age 62 at the time) or to Final Fantasy, played by Barbara St. Hilaire (age 70, when mentioned), both interviewed on National Public Radio (Cohen, 2006). In the years that Whitcomb (University of South Carolina) presented his paper at the Symposium on Computers and the Quality of Life (1990), focus was on how the elderly (as they were called in those days of less than politically correct expression) can “keep up with recent developments ?,” and on how to improve “the range and quality of public services, of which the elderly are heavy consumers” (Whitcomb, 1990, p. 112; he also cited Elton, 1988). Yes, the elderly of those years, not unlike the seniors or aging of our own time, got better in playing the more they played (some even became addicted to games). And they enjoyed games as a more active form of entertainment than watching TV (never mind staring at an empty wall in isolation). What changed from those early beginnings is the understanding that games are not only for entertaining senior adults, but that the process of aging itself can be influenced. In some cases (e.g., epilepsy), conditions can be aggravated by the wrong types of games. This improved understanding was not reached over night, and, frankly, is not yet as conclusive as we would sometimes like to believe—or are prodded to believe by the slick marketers of their wares. 1. The demographic of the commercial games on the market, that is, what Ijsselsteijn et al. (2007, p. 17) describe as “a significant potential niche market for game developers.” The more seniors can be enticed to get involved with games, whether for health or entertainment, the larger the market. 2. Motivations of seniors to engage in gaming— to learn, interact, have a good time, fill available time, benefit from gaming (earn money, gain recognition, improve health). 3. Conceiving, designing, producing, deploying, and evaluating games with therapeutic aims. The three aspects are not independent of each other. Young and old, male and female, educated or not, poor or rich, regardless of race and cultural identity, enjoy good games, i.e., games with an attractive story line, rich interactions, good design, and ability to engage. Some people— those who can afford the games—benefit from gaming; others, aware of their limited means, seek community-based game-playing opportunities. The motivation factor in respect to seniors is quite different from that of their children and grandchildren. Seniors will rather use stationary games than those available on cellular phones. And if there is anything that can make seniors lessen the burdens of aging (aches due to various causes, diminished performance, dependence on others, insecurity, etc. ), they will use their resources (time, financial), or they will gladly partake in community-supported activities. Numbers don’t tell the whole story, but they are part of the story. According to recent statistics (ESA, 2008), the fastest growth in the adoption of games is in the senior population (double digits for the last five years). Gamers under age 18 (25% of all gamers) used to dominate the market. Now gamers 50 years old and older make up a slightly larger segment (26%), which is increasing very fast. At almost half the market, gamers 18-49 years of age exercise, through their expectations, the most powerful influence on the industry. They want excitement and push for everything that gets their adrenaline high, and that fills the last available second (after text messaging, games are the biggest application in the mobile phone industry). The most telling change is from playing alone to playing with others: the percentage more than doubled from 29% in 2004 to almost 60% today. For the aging—who also play more and more with others, of the same age or younger—this translates into better social interaction. Action games and entertainment games are still the most popular among seniors; role-playing games (RPG) also rank high. However, the dynamics is such that games for health—still a recent category—are increasingly acquired by those in the middle years and by seniors. While Halo 3 (for the Xbox 360) and Call of Duty: Modern Warfare, Super Mario Galaxy dominate the market, Brain Age has made inroads; the Wii play version with remote rated as second among the 20 top selling games in 2007. In 2008, many newcomers have tried to penetrate the market. Among the types of online games played most often, strategy and role-play figure quite high; so do puzzle and board games. Competitive gaming, preferred by younger gamers, is yet another trend in the fast growing senior involvement with games. As for therapeutic games, exergames of all kind—from the ubiquitous DDR used for weight control in younger populations (Carson, 2006; 2008) to mobile phone platforms for working out—satisfy the needs of youngsters, while a wide variety of mind-and-body games—ranging from Nintendo’s brain training to Xavix’s golfing and fishing—are geared towards the aging. Therapeutic games, including Second Life developments, make up almost 65% of the entire games for health market. It is clear to any observer of the game market that the industry is assiduously data mining these and many other numbers. Nintendo’s strategy is living proof of their understanding how to effect a shift of focus from 18-year-olds and young adults to affluent middle-agers and seniors. Other companies, such as Xavix, and even Sony, offering products at least as good, have not been able to penetrate the market with a similar rate of success. What is not clear is how the industry is meeting its obligations and promises to aging players without having developed its own research agenda for games for health, or without having funded such research. In view of such questions, the next part of this study will focus on the attempt to make therapeutic games available to the rapidly growing senior population, and especially on providing means for validating the results of involvement with such games. Again, a short look back: Clark, et al. (1987, p. 83) noticed that games show a promising potential “to improve selection” abilities. Ten years later, Goldstein et al. (1997, p. 346) “studied the effects of playing video games (Super Tetris) on the reaction time, cognitive perceptual adaptability, and emotional well-being of 22 non-institutionalized elderly people aged 69-90.” The result: “significant improvement in ? reaction time, ? relative increase in self-reported well-being.” Important note: The strongest effects were recorded on measures of reaction time, and the weakest on cognitive performance. When Nintendo reached the conclusion that a neurologist, Ryuta Kawashima (2003), author of a popular book on brain training, could inform their own effort to expand into the market of senior gamers, the company was aware of articles such as the ones mentioned above. But science does not simply translate into effective and engaging games. The neurologist Kawashima—who eventually became a game character because the company built on his credibility as a scientist—translated his observations on regular mental exercises into clean competitive actions: counting the number of syllables in phrases, memorizing words, performing simple arithmetic operations. This is how Brain Age: Train Your Brain in Minutes a Day, played on Nintendo’s DS hand-held system, came into existence. Holding the dual-screen device open like a book, players can use the built-in microphone or the touch-sensitive screen. These are easy, very intuitive ways to interact with the game. And the output is much more directly related to mental health than is the outcome of playing with Super Tetris. In the game, a so-called “brain age” is defined, and the goal is to improve it over time, that is, to get a “younger” mind by playing, and playing, and playing. Fourteen basic activities and additional side games are made available. Once the number puzzle game SuDoKu became popular in the USA, it was integrated in Brain Age. There’s nothing like success! At the time the game was released, the connection between engaging the mind and improvements in cognition was not convincingly documented. The gamers’ improvement in the game itself was quite impressive; but the supporting data regarding how this translated into real-life situations is still not available. Michael Merzenich (2008)—popular through the sponsoring of a fundraiser for PBS, where he (and others) explained aging, and how his own game could delay it—built on neuroscience expertise that reaches back to brain plasticity (Merzenich, 2008; Ellison, 2007). The Brain Fitness Program (marketed by Posit, a company in which the scientist has a minority interest) starts with simple fine-tuning exercises targeting the auditory system. It is different from crossword puzzles in the sense that it engages more sensory information and animation. With some other game based activities, Merzenich focuses on treating individuals affected by schizophrenia. Although some improvement was documented in clinical trials, the results are not yet conclusive. Posit sponsors evaluations by independent practitioners in the healthcare sector, and this is encouraging. But as games on their own merit, Posit products are at best rudimentary. This applies to the scripts, to design, to interactions, and to user interfaces. Even before we have conclusive data regarding their therapeutic effectiveness, what needs to be acknowledged is the path: address the fact that brain plasticity can be affected by engaging individuals in interactions beneficial to their cognitive performance. George Bernard Shaw, the famous playwright, elegantly summed up the problem of aging: “We don’t stop playing because we grow old, we grow old because we stop playing (Shaw, G.B., n.d.).” This highly descriptive but rather unscientific hypothesis predates video games and computerbased games. It was formulated at a time when playing was more than activating buttons on a console. Play included chess and backgammon, poker and bridge; but it also referred to games in which the entire body and the mind were engaged. A 90-year-old would probably avoid hide-and-go-seek, not to say tennis, golf, and bowling, which involve a physical component that could expose the player to the risk of falling, bruising, losing balance, or injury. But is there a way to be wholly involved, mind and body, without inviting the risk of getting hurt? If such ways exist, growing old would no longer entail giving up play because it is dangerous, or because the element of competition involved implies physical resources no longer available. Interesting enough, from the pen of the same writer came the statement, “I dream things that never were, and I say, Why not?” This might have made little sense when it was printed (well before word processing, mind you), but today, in the age of games, it sounds almost prophetic. As suggestive as they are, Shaw’s ideas cannot guide the effort of conceiving games for the health of the elderly more than any other generality can. Let’s be clear: only a good scientific foundation, representative of the wealth of knowledge accumulated in respect to aging can be accepted as a premise for such games. When it comes to health, to life, to individuals who earned the right to be treated with maximum consideration, there is an obligation to work under the requirement of zero error. This translates into the obligation to consider the end of life not as a stage of resignation and defeat, but of taking advantage of opportunities—especially the opportunity to continue an independent life in which so much more can be learned, enjoyed, appreciated, and contributed to the lives of others. But games are not, and should never be, presented as yet another miracle cure for what might ail women and men willing to enjoy the rewards of their toils. Nintendo’s successful attempt at addressing cognitive characteristics and the attempt of Posit’s Brain Fitness program are testimony only to an attitude of responsibility. Their limitation is the reductionist idea that if we train the mind, we will be able to arrest further inevitable mental deterioration. This is not a goal to be underestimated. Millions of aging gamers invest time and trust in such games on a daily basis. These games were, naturally, copied immediately; and it is almost impossible to say if the imitations are drastically different from the originals. 1. Aging, along with the associated costs (not just in dollars), is a major health problem (see the United Nations Programme on Ageing Website). Many resources are utilized for fighting aging and its effects at its core (genetic, molecular, neuronal), but few for attenuating the consequences of the basic aging process. The fact that the post-World War II baby boom generation will be reaching elderly status in the coming years adds urgency to the need to address foreseeable problems before they occur. This situation is tantamount to a Sputnik for research in aging, similar to what became the impetus for the American space program. Let us again be as blunt as possible: If the meltdown of financial markets (since April 2007 and ongoing) is an indication, not addressing the consequences of aging in due time could result in an even less manageable situation. Not only money is involved, but also the fabric of society. 2. In respect to the research on aging and anticipation, which is the focus of this study, an exceptional situation was created by the start of a new program—Arts and Technology, ATEC for short, at the University of Texas at Dallas—focused on game design and development. This development stimulated ways to integrate results from the study of anticipation— in the broadest sense—and new developments in game design. Consequently, the following rationale for the project was articulated almost four years ago: Aware and respectful of the research in progress, especially in the area defined as brain plasticity, or rewiring, we attempt to integrate its results with a new approach: combine the will of the aging to remake themselves, to live in a dignified manner, to enjoy quality of life, with available means other than medication for maintaining characteristics that make life worth living; in particular, with means that engage the individual, such as interactive games—understood in a very broad sense—that stimulate an active path of maintaining anticipatory characteristics. Games are open-ended, competitive, nonlinear stories with an embedded wager (reward mechanism). Involvement in games can be physical, cognitive, emotional, and/ or social. It always entails learning, which is why games are adopted for all kinds of training. Documented through research is the impact of game involvement in active recall of information; coordination skills, especially eye-hand coordination; reaction time; predictive thinking; decision making; and collision avoidance. These are all the result of the anticipatory characteristics of human beings. More to the point: maintaining these characteristics can become concrete objectives in elaborating new games aimed at benefiting senior adults. Figure 1. Mapping from the brain to game design. Why is the emphasis placed on anticipatory characteristics? To start at the end: Senescence is the stage at which anticipation degrades to such an extent that the body is practically reduced to its physical-chemical reality (cf. Rosen, 1985; Nadin, 1991). Anticipatory characteristics of the living— human beings, as well as other life forms—are fundamental to the preservation of life, moreover, to the performance of rewarding activities (learning, sports, creative acts in general, orientation in one’s immediate environment and beyond, etc.). 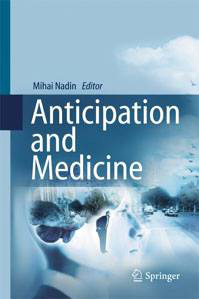 Anticipation is understood as “the sense of context” (Nadin, 2003, p. 27); better yet, as the expression of the human being’s adaptive performance. This translates into the ability to successfully operate in a world in which knowledge of the order and repetitiveness of physical phenomena is insufficient for coping with life’s unexpected aspects, in particular, change. The anticipation of danger, as well as a successful course of action, in a competitive or non-competitive context, is part and parcel of our existence. We negotiate steep slopes of downhill skiing not through reaction only, but especially through anticipation. We learn how to use tools (including the new “virtual” machines) with the aid of our anticipatory characteristics. We define goals and methods for small tasks or for an entire life in anticipation of ever faster changing contexts. Games for Health, whether for seniors or adolescents, can take many forms, and can be guided by a variety of premises. As already pointed out, mental health—which some understand as memory performance, the ability to think and reason, stimulus recognition, and the like—is addressed by games that engage the mind. Ideally, playing such games would result in higher confidence in handling tasks associated with daily life. Activation of mental abilities corresponds to the recruitment of various areas of the brain. Therefore, the game designer for such particular games has to be able, under the guidance of medical knowledge and in permanent interaction with healthcare professionals, to map from the desired goal of stimulating specific neural processes to the means to be used. As obvious as the reasons for closely working with competent healthcare professionals are, they are worth repeating. People who develop games for the military, for instance, or for training firemen, would not play armchair expert; they would involve experts, from the initial concept to testing and evaluation, and to periodic follow-up and adjustments. This is the reason why students of game design engaged in Project seneludens were taught in the spirit of interfacing with medical experts (neuroscientists, physiologists, therapists, etc.). In order to identify significant neural processes, we worked closely with experts in the field. Furthermore, we came up with new ideas for game environments (such as new I/O devices). The interaction between senior adults willing to play and the game became our focus. Furthermore, we cannot make any progress in this area if we do not realize that human beings do not age the same way. Therefore, accounting for differences is by far more important than assuming some averages. All this became the focus of graduate seminars and of research work that involved gamers, designers, story-tellers, computer scientists, virtual reality experts, and medical personnel. Students were also guided towards understanding the need to develop validation procedures and to test the effectiveness of their games (Nadin, 2006). Games for Health, in particular for senior adults, became subject to evaluation in various settings, including brain imaging. As we performed our own work, we learned that the data linking mental training to improved cognitive performance was not necessarily evincing more than improved performance on the tested tasks. In other words, regardless of how appropriate a game was, the more the seniors played it, the better they performed in the game. Therefore, the path we chose was a more complex behavioral therapy that integrates games supporting coordinated physical and mental engagement mediated through sensory input. A variety of studies make it clear that physical exercise and cognitive stimulation go hand in hand. In particular, we interacted with the Institute for Neuroinformatics (Ruhr University- Bochum, Germany, headed by Dr. H. Dinse), known for it studies on animals that can easily (and plausibly) be generalized to humans. 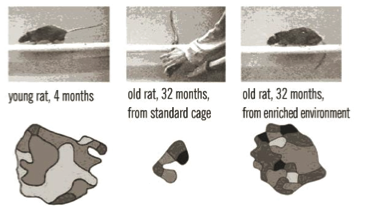 Animals (rats, in Dinse’s case studies) placed in enriched surroundings show improved dendritic branching and neurogenesis. Physical activity proves to be linked to higher performance on cognitive tasks. The exercise-triggered neurotrophic factors and the better flow of blood to the brain (so-called vascularization) speak in favor of extrapolating such results to humans. Figure 2. Physical activity is linked to cognitive performance. The need to integrate cognitive and motoric capabilities is illustrated by brain activity. Figure 2 illustrates how the enriched environment affects brain activity. It is worth pointing out that the enriched environment includes motoric activities. This is even more relevant for human beings who in general already benefit from a level of comfort higher than in the past, but which usually results in diminished physical activity (sedentary patterns). Consequently, a working hypothesis was formulated, integrating knowledge of anticipation and studies such as those mentioned: In order to address the fact that an individual’s adaptive capabilities decrease with aging, we need to stimulate brain plasticity through games that simultaneously address cognitive, sensory, and motoric capabilities. The metrics for assessing anticipatory characteristics and how game playing impacts them corresponds to characterizing the performance of an individual in action. Therefore, the project’s goal becomes the characterization of human actions and the focused attempt to improve performance through game playing. Figure 3. The goal of project seneludens. Figure 3 divulges that the entire effort presented in this study starts with defining the Anticipatory Profile™ of each individual (to be discussed in some detail shortly) and leads to individualized involvement with games that integrate sensory, cognitive, and motoric aspects. Validation, in this case via brain imaging (although other methods are acceptable), returns information on how successful the game behavioral therapy has been. The hope and goal are that decline in adaptive performance can be postponed, i.e., that independent living for senior adults can be extended. Does all this, which some game designers might consider totally beyond their interest and focus, mean anything to those who want to engage in games for health, in particular to senior adults? The question is not rhetorical. Gamers do not, and should not, care about the theory behind the game. They should never come up with their own theories. But the credibility of games as therapeutic means cannot be disconnected from the foundations of the effort. To these foundations belong, of course, conception of games, design, development, production, and testing, and their improvement as predicated by experience gained in using them. It is obvious that game companies will not—and actually should not, even for the sake of a very attractive market share—begin the kind of animal research mentioned above, not to say research on human subjects. But it is also obvious that ethical considerations, as well as risk mitigating factors, speak in favor of interacting with the scientific community in order to identify possibilities, as well as limitations. The same holds true for interacting with game designers, artists, engineers, psychologists, computer scientists, etc. In what follows, I will describe the very promising path, informed by the science of anticipatory systems, that we pursued. It is not the only conceivable path, and so far others have followed it rather marginally (Meyer, et al., 1997). The advantage of the methodology to be described is that it offers practical answers to game-specific questions. It also provides validation mechanisms that rely on the same procedures through which we generate characters for games. As already stated, no one who is seriously committed to Games for Health can avoid working within a context of validation, and without subjecting the work to the same. In the development of anticipatory characteristics, games of all kinds—from simple interaction (hideand- go-seek, tennis, bowling, golf) to elaborate machine-supported performance (e.g., interactive games)—play an important role. Each game is a physical entity—described by the physics of the respective game (different in basketball, golf, football, chess, etc. )—and an anticipatory process: the outcome (future) defines the current state of those playing (tennis, pinball machines, cards, or some other game). Aging affects not only high performance (in athletics, chess, monopoly, backgammon, etc.) and learning, but even the willingness to play and to continue acquiring knowledge. Limitations brought on by aging—deteriorating vision and hearing, limited tactility, reduced agility and strength, reduced sense of balance, impaired cognition, and a sense of alienation or even exclusion—make games difficult to handle and even to accept (the “What for?” syndrome). Thus games, and play in general, are progressively eliminated. Physical and cognitive challenges, as well as social attitudes encountered, affect the abilities of the majority of the older people. To overcome such obstacles, we need to engage healthcare professionals, insurance companies, families, and the media. And we need to offer attractive video or computer games. Until recently, games and play were eliminated from the lives of the elderly when they actually need them most. To reverse this situation is not easy, but the process already started. Video games and computer-based games are making a difference. Appropriately conceived games could fill the void of increasingly isolated men and women by maintaining physical and cognitive characteristics and social interconnectedness. Project Seneludens (www.seneludens.utdallas.edu) is focused on designing games and other therapeutic behavioral environments with the specific aim of maintaining anticipatory characteristics during the aging process. (The title is derived from two words: senescence, from the Latin sene, “old age”, referring to changes that take place in a living organism as time advances; and ludens, as in homo ludens, playful human, playfulness being a characteristic of humankind.) It is known, and amply documented in scientific literature, that play, as an active form of involvement in a rewarding activity, fulfills necessary functions. It is practice for real-life situations. Play develops physical, mental, and social skills, just as it relaxes the mind and body, without the deleterious effects of extended televiewing and other forms of passive distraction. Based on the cognitive and psycho-physiological mapping of human characteristics at the stage of life when aging is noticeable, we defined the structure and nature of a new category of games, and other play-conducive environments, pertinent to this phase. 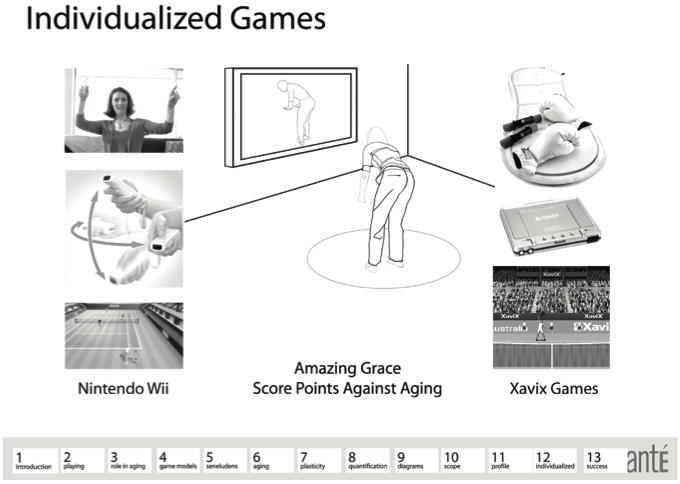 Based on results from current advanced research in the cognitive neurosciences (accumulated in clinical observations and other experiments, especially in brain research), we initiated the design of games and interactive behavioral therapy environments that support the active maintenance of anticipatory characteristics of the aging. Such games have an important learning (and reward) component. The metaphor of mirror-neurons (Rizzolati, et al., 2000; Gallese, 2001) i.e., neuronal configurations generated as people attempt to imitate an action (mimetic procedure), was repeatedly confirmed in game situations. Indeed, watching a football game or a tennis match engages the viewer in ways reminiscent of their own playing. More challenging situations (jumping, jogging, driving) experienced in a game make the player emulate—even if only partially—the condition. Neuronal configurations and muscle engagement testify to this. The image in Figure 4 is suggestive of something we all experience: showing someone else how to perform an action (let’s say, putting in golf). Once the person we train starts performing, we kind of partake in the action, almost like “pushing” with our mind in sync with our apprentice. This is the simplest experience of mirror neurons at work. Watching a game (tennis, baseball, boxing) often engages viewers almost as though they were playing. Sure, the physical effort is not duplicated, but the mental experience is real (and rewarding). â€¢ Environmental enrichment and behavioral training increase brain responses. â€¢ In order for plasticity to occur, the triggered sensory experiences should be behaviorally relevant (i.e., the nature of the task is important). â€¢ Task difficulty plays an important role in inducing brain plasticity. Only in a limited way are these findings sufficient for specifying the type of activities conceived for the aging that should be made available through games. They constitute a methodological premise in the attempt to define the individual nature of the behavioral therapy made possible through the medium called game. These findings also fully confirm the anticipatory perspective, i.e., the proactive nature of the wellness model that project Seneludens pursues. Virtual activities (fishing, boating, swimming, climbing, bowling, etc.) are immediate candidates for games built on the premise of mirror neurons. The degree of realism, which new technology supports better and better, is reflected in their effectiveness. Games and behavioral therapy are not a cure. They facilitate improvements, but not a return to full performance. Actually, a more responsible description is that they are rather methods of prevention. Their precise objectives are maintenance of the human being’s anticipatory characteristics, and delay of the onset of cognitive, sensory, and physical decline. Even for these objectives, games have to be engaging and stimulating; they have to offer a challenging learning curve. Very important is the creativity intrinsic in the project’s goal. To conceive of games, i.e., play structures, that translate into behavioral therapy is to invent a category of artifacts that can be individualized, are engaging, display adaptive properties (i.e. reflect the dynamics of aging), and support brain plasticity. For example: a tennis game, with simulated forces (the serve, returning a fast ball) will have to be adjustable in terms of speed and physical effort. These games will have to offer multi-sensory environments in order to stimulate the interplay between sensory driven actions and mind-initiated actions. Since sensory performance is affected by age, we have to provide ways to compensate for lower performance by providing cognitive cues. Some examples: an image can suggest the sound no longer perceived due to deafness; movement, as animation or realistic rendition, can carry haptic and temporal information. This is a challenge, but also an opportunity. Moreover, the games need to be designed in a manner that supports the customization effort. Whether the game’s object is space exploration (with time somehow left our or of marginal significance) or the experience of time, what is essential is to associate the playing aspect with the desired impact on the cognitive and motoric performance. Aspects as simple as: Can the player pause the game? Does the game allow for synchronous actions? Who controls the game? (the so-called internal control aspect) translate into engaging brain plasticity in a desired direction. To alter the game environment (i.e., in a game like Lemmings, this is possible), or even to add content (such as new features in Second Life) are not to be understood only as attraction features, but as means for stimulating the player’s active contribution. Even game decisions such as whether the player should see the whole game area (such as in Badminton), or become familiar with it as the game unfolds (BioFighters is a good example), need to be addressed from the very precise perspective of cognitive performance. Each game that is focused on the health of senior adults has to provide options for customization. In studying various processes accounting for human memory, scientists have advanced the complementary model of an action and drug based cure (Tully, 2005) (see Figure 5). The goals of Seneludens are farther-reaching than memory maintenance (although memory is an implicit theme). They include replacing experience as a generic term through the variety of interactions that games and play afford; associations, minddriven actions (Nicolelis, 2005); mirror neuron generation; and heuristics (the discovery of new possibilities). Neural circuitry becomes neuronal configuration, and expressions become performance level in the game. We do not exclude the possibility of using appropriate medication (Dinse, 2005), although this aspect is not a specific goal of the Seneludens project. For people involved in developing games that address the well-being of adult seniors, it is advisable that they consider non-game attempts (such as drug-based remedies and even classic therapies) and try to duplicate their structure. This is not an easy path, and it always requires the effort of medical experts in addition to game designers. But it is a good model, at least because medical practitioners are no less inclined than patients themselves to look for no-drug/no-surgery alternatives for healing. The aging themselves prefer to entertain non-invasive methods instead of medication for maintaining their viability. The current science and technology that will eventually be embodied in new products to aid the aging were not conceived from the anticipatory perspective. As we know from the games developed to help train the military, they are rather the expression of the science of the physics, but not of the art of living. The new generation of creative designers and artists, who also acquired expertise in the computational, will have to express their creativity in a class of products that defies the industrial model of one (product, in this case, game) for all. The alternative is the customized, individual product that specifically targets the cognitive dysfunction of the individual to be helped. The metaphor of mirror neurons (see Figure 4) suggests that we can conceive of games that can “teach” their players how to improve their motoric performance as well. We have the science and technology for achieving this. But we do not yet have the knowledge and art necessary for creating variable products with adaptive characteristics. How Do We Generate Data for the New Games? In view of the unavoidable requirement of working with medical professionals, as project Seneludens was defined, I contacted major health professionals in Dallas. From the many contacts established for this purpose, one dialog with the Medical Director for Research at Presbyterian Hospital (Dr. Mark Feldman, MD, FACP) remains vivid in my memory. I explained the context of anticipation, as well as the opportunities to conceive games intended to help maintain adaptive performance in aging men and women. Dr. Feldman had only one question: How are you going to measure anticipation? He added, “We healthcare practitioners follow very precise research protocols. Our focus is always on documenting changes associated with therapy. And for doing so, we measure.” Since that conversation, I have always credited Dr. Feldman for starting me on the path of quantifying anticipation. This was the beginning of the Anticipation- Scope™. Anticipation is expressed in action— avoidance (of danger, such as slipping, tripping, or being struck); successful performance (catching an object we did not even see coming); preparation (for changing position, such as raising arms, an example to which I shall return). Therefore, the measuring process has to reference the action. In other words, if we want to see how raising one’s arms is preceded—anticipation is something that happens before—by cognitive and motoric performance, we need to juxtapose a description of the action and the cognitive and motoric parameters to be measured. Leonardo da Vinci (1498) observed “…when a man stands motionless upon his feet, if he extends his arms in front of his chest, he must move backwards a natural weight equal to that both natural and accidental which he moves towards the front.” That is, a physical entity modeled after a human being (in wood, stone, or metal) would not keep balance if we raised its arms because its center of gravity changes. Figure 6 makes the point clear. Compensation slightly precedes the beginning of the arm’s motion. In short, compensation occurs in anticipation of the action, not in reaction to it (as Libet’s, 1980-84 work on the brain’s readiness potential confirmed). The AnticipationScope quantifies the process by capturing the motion, not on film or video, but in the mathematical description (as a matrix) corresponding to high-resolution motion capture technology. 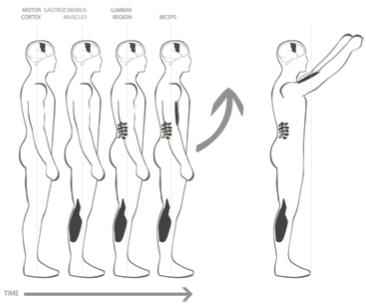 This description allows us to focus on single points on the body and to pick up even the slightest tremor or motion characteristics (of joints, body segments, muscles, etc.). Known sensors, such as EMG, goniometry, accelometry, blood pressure, EEG, among others, and new sensors, developed as significant parameters are identified, are applied to different parts of the body. These sensors capture the various preparatory processes, as well as the reactive components of maintaining balance. The Game Program at ATEC/UT-Dallas has benefited from a motion capture lab early in its inception. Based on this felicitous situation, I suggested that instead of filming a subject raising his/ her arms, we should motion capture the action. 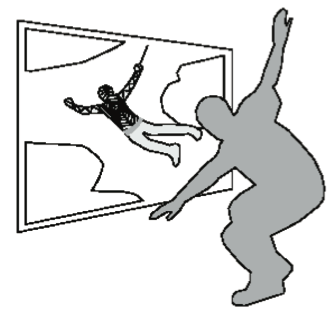 In motion capture, the description results in a matrix corresponding to high-resolution “scanning” of the body in action. Such a quantitative description allows for focusing on single points on the body and for picking up even the most evasive tremor. However, in order to fully capture the expression of anticipation, we need specific values of physiological parameters affected in the action. Therefore, I designed an integrated system of motion capture and sensors attached to specific body parts. The first objective was to create a measuring environment that does not affect the free movement of the subjects of quantification. The second objective was to integrate motion capture data and sensor data, which are of different formats and different timescales. The third objective was to design a data processing program that allows for examination of the multitude of information collected, and for eventual aid in identifying the expression of anticipation, moreover, in describing it quantitatively. This architecture further informed the information processing model. It needs to be emphasized that even working with medical professionals does not automatically mean that all questions pertinent to the procedure have a well-defined answer. For example: Which physiological parameters should be monitored? In medicine, attempts were made to describe some functions (e.g., cardiac profile, which means all the known elements that affect heart functioning). Still, even medical practitioners could not name all the physiological parameters that need to be considered. We knew one thing: as we try to quantify anticipation, we are focused on the totality of the human being. Therefore, we look at descriptors that few will associate with how well we adapt. Example: tympanic temperature. Dr. Michael Devous (University of Texas-Southwestern Medical Center) suggested this parameter as we tried to find out how we can capture the brain activity component when the subject jumps, catches a ball, or goes up and down stairs. At the current stage of technology, brain imaging or other brain monitoring techniques cannot be considered. It turns out that tympanic temperature is representative of the engagement of the brain in certain actions. Therefore, it provides some information regarding brain activity. Together with Dr. B. Prabhakaran (School of Engineering and Computer Science, UT-Dallas) and Gaurav Pradhan (Ph.D. candidate in Computer Science), we designed and implemented the data acquisition and data processing procedure. From this effort, a number of research goals were accomplished (Nadin et al., 2007a, 2007 b, 2008). They are the result of my concept for an AnticipationScope and of efforts to engage a large sample of subjects (over 75 in 3 years) in a variety of experiments relevant to the final goal, i.e., the development of games that can contribute to the well-being of senior adults. It should be made clear that this preliminary research was not geared towards producing medical data or developing algorithms relevant to integrating a variety of data types. My goal was, and continues to be, to see how the quantified anticipation eventually translates into specifications for games and how such games can be used effectively for compensating, through brain plasticity, for lost anticipatory characteristics. Therefore, parallel to elaborating the AnticipationScope and defining the Anticipatory Profile, I worked with a postdoctoral research assistant, Dr. Navzer Engineer (Ph.D. in Neuroscience) in defining the typology of experiments, and in developing meaningful experiments for our ultimate purpose. If indeed we want to create game-based behavioral therapy, which is also “individualizable,” we need to find ways to translate the Anticipatory Profile into those cognitive and motoric actions that make up a game capable of stimulating brain plasticity. Anticipation is carried out on the neuronal level and precedes action by milliseconds. These milliseconds can make the difference between protection (“knowing” how to fall, for example) and injury. Anticipation declines as people age, making them susceptible to injury (damage resulting from not “knowing” how to fall), which is complicated by advanced age. Furthermore, anticipation is a major factor in successful game playing, as well as in sports and high-performance activities. By their nature, games and sports (e.g., card games, chess, tennis, hockey, downhill skiing) imply an anticipatory element in that the player who can best anticipate is successful. This project relies on data from experiments focused on brain plasticity. Success entices a player to play better, hence our aim to develop games that can be targeted. Success entails positive emotions and attitudes; it is self-motivating. The following examples of games is indicative of the direction followed, i.e., create games with a focus on stimulating anticipatory action and evaluate their effectiveness. With this aim in mind, we have worked with XaviX, Inc. since 2005 and accumulated experience that can be generalized. (XaviX is also providing equipment to UC-San Diego researchers at the School of Medicine who are studying exergames as an option for motivating and sustaining the physical activity of adolescents.) In continued collaboration with XaviX, Inc., project Seneludens is evaluating the effectiveness of several types of games now on the market in maintaining and/or improving cognitive-motoric abilities. The C.C. Young Retirement Community (Dallas) has installed the XaviX MindGym for use by their residents. Deploying the AnticipationScope, we measure changes in the adaptive capabilities of the persons involved (ranging in age from 55-90) and refine theory-based principles. 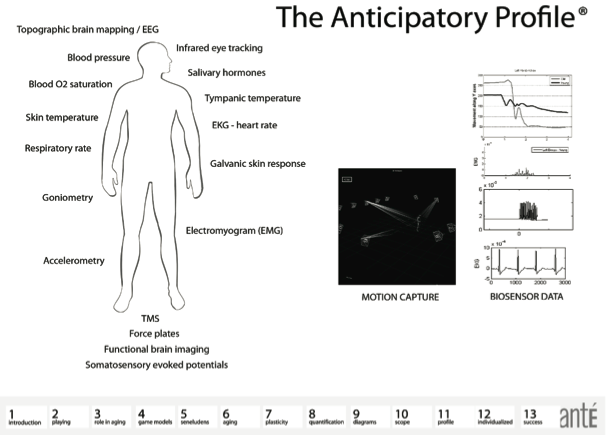 The unique contribution lies in the quantifying anticipatory capabilities (“anticipation”) of the persons participating in the data collection. Although the researchers are using games provided by XaviX, Inc., along with Nintendo Wii games, in the future, they might use proprietary prototype games developed by the ATEC faculty and students for the US Army (a project begun in 2006). This also corresponds to our final aim of elaborating a new type of interactive games and gaming environments for targeted therapy. XaviX EYEHAND, for example, is a multitask training interactive game that stimulates the integration of cognitive and motoric abilities. These are expressed as decisions, reflexes, and dexterity. On-screen instructions inform the player about actions performed using Glove Sensors attached to the hands. The EYEHAND training system uses a CIS (cmos image sensor) camera mounted on the system cartridge, together with motion sensor technology, that accurately recognizes and captures the movement of the gamer’s hands. The players are requested to move their hands in sync with the two orbs animated in a fixed pattern. This mode stimulates the performance of multiple tasks simultaneously. Other tasks involve touching the panel of the specified color that appears on screen. As the player scores points for each correct action, the variety of goals increases. In this particular mode, the purpose is to develop discrimination capabilities and improve reaction time. Other scoring possibilities involve improving the speed of actions (“catch butterflies with both hands”), ordering abilities (grab numbers in ascending or descending order), memory performance (memorize patterns and positions of cards). This game benefited from the input of a cardiologist (Dr. Yutaka Kimura, professor at the Kansai Medical University). Another game of similar anticipatory focus is the CardioFitness workout routine (which can also be called “Run and Have Fun with Jackie Chan”—who is the animated character selected for the purpose of engaging players). Walking, running, jumping, performing squats, and avoiding obstacles are part of this personalized set of ten gradually more challenging routines. Evaluation of the improved anticipation of gamers of all ages provided us with valuable data regarding the integration of cognitive abilities and motoric performance. Actually, even a handicapped senior adult can fully enjoy the games using leg(s) and body movements. The way in which knowledge pertinent to anticipatory processes can inform the design of such games remains the major focus of project Seneludens. Quantification of the results of game involvement of the aging is by now the subject of a Ph.D. thesis (Melinda Andrews is the Ph.D. candidate) in progress that will benefit from the interaction of the antÉ Institute, the C.C. Young Retirement Community, XaviX, the School for Behavioral and Brain Sciences, and the School of Engineering and Computer Science (both at UT-Dallas). This application is based on documented evidence of the many benefits associated with African dance movements aiding villagers in Senegal and Benin (as well as in other countries in Africa) develop and maintain physical and mental well-being. In particular, these movements, in which anticipation is expressed in a variety of actions meant to maintain the dancers’ sense of balance, rhythm, and coordination. They were introduced to us by Germaine Acogny, one of the most important dancers in the world today. Expression of rhythm, movement, and coordination in a simple dance could help in addressing problems of the aging within populations that are becoming more sedentary. In their wisdom, African villagers understood that mind and body reach their harmony as they stimulate each other. Acogny, in turn, understood that the dances that inspired her art are also an expression of knowledge. When I explained to her that we could actually show how someone who practiced her selection of movements would be positively affected by them, she spontaneously offered her cooperation. One year later (in April 2007, after our first meeting in May, 2006), she and her drummer came to the AnticipationScope. During five days of sessions, we were able to fully motion capture her selections, to look at details, and to see how these translate into stimulating brain plasticity. Based on this, we aimed at developing customized families of dance games that allow for individual and collective sessions. AmazingGrace was conceived as a video game in a manner that does not require technical skill for using it. Acogny herself paid attention to the therapeutic aspects of the dances from which she extracted her “exercises.” As far as I know, some of this work concerning the role of rituals and dancing in supporting the health of senior adults was validated by researchers in Europe and the USA. Let me mention the work of Heather Lundy (2002), especially her attempt to incorporate dance and other therapy techniques. Mirror neuron research, which our Institute considers as a very powerful technique for documenting how dance affects young and old, also produced some important data validating the claim. The interested reader can also refer to Hanna (1978, 1995). Like all our work, this game was devised in a context in which we can also quantify the benefits of involvement with it. That is, we can see how effective daily dance exercise is. There is no standard dance to be performed, there are selections, and there are procedures for customization. Each selection corresponds to what the individual can afford from a cognitive-sensory-motoric viewpoint. For the aging, the level of individualized selection is determined by their particular abilities and the goal of the action (focused stimulation of brain plasticity). Convincing the aging to participate in such a game is not a barrier, as some are inclined to believe. So far, each time senior adults were addressed, they showed interest and determination to follow through. One can get involved with AmazingGrace while in a wheelchair. There are limited movements, which can be performed even by someone bedridden. This is what distinguishes the game from other exercise routines. Brain plasticity can be stimulated without putting anyone in a dangerous situation. What needs to be further addressed is individualization, that is, customization to the person. This applies to the movements and rhythms, as it applies to coordination when two or more persons are involved in the dance-game. Germaine Acogny generously offered time, knowledge, and experience. During her visit to the Institute, researchers performed high-resolution full motion capture of her dance movements. 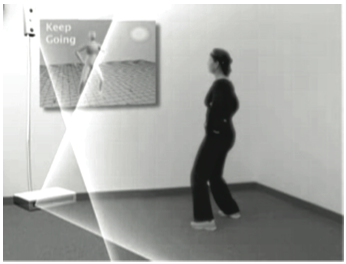 Using the AnticipationScope, we also evaluated the significance and effect of each movement. Based on this data, we are now working on further generating the animation for each sequence. The animated character/characters drive the interactive game. Our challenge is to integrate the animation with the person/persons, young and old, who will eventually use the game. We need to develop a mapping from the movement to the performing individuals so that characteristics such as cursivity, expressiveness, synchronicity, balance, etc. can be monitored by the game. To dance means to learn, and this learning addresses cognitive and motoric characteristics. To dance also means to enjoy movement and rhythm in the company of others. The transfer of knowledge, from the dance captured to the aging affected by sedentary life, remains a major objective. In concrete terms, we proceeded from the living dancer to the motion captured images to modeling and animation. The image associates the experience of dancing in the Senegalese village (Toubab Dialaw) where Acogny works to a routine she developed with the aim of helping individuals in need of improving their adaptive capabilities. 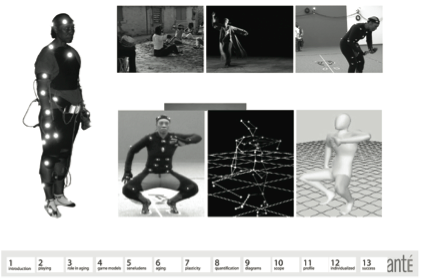 Also documented is the sequence from motion capture to the creation of the avatar that interacts with the users of the game. Since the gamer is engaged in the dance, we had to conceive of procedures for comparing the details (Acogny pattern vs. individual pattern). Based on these detailed comparisons, the goal of matching the original movement and the movements of the senior adults involved in the game also became a scoring component. Indeed, each game is driven by a “wager,” the reward mechanism being yet another example of human anticipatory characteristics at work. One of the challenges is to keep the interactive platform to a minimum. (In order to fully evaluate the movement of a gamer and compare it to that of the game avatar, we would need a full motion capture setting, with at least three cameras, which at this juncture in the development of technology is not yet a practical solution.) Therefore, we developed minimal tracking algorithms (very similar to triangulation) and a feedback mechanism with a reduced set of control possibilities. Based on knowledge accumulated from the AnticipationScope and from project Seneludens, a number of associated game projects were derived, and chances are good that the development platform we conceived and tested so far will be used for a wide variety of games with a focus other than the aging, but always relevant to the health of senior adults. We ourselves are pursuing games addressing the broad category of spectrum disorders (Parkinson’s disease, Alzheimer’s, PTSD, autism, etc. ), as well as games pertinent to extreme situations. One of such games was prompted by the tragic lack of preparation for Hurricane Katrina, in which many adult seniors lost their lives (see Figure 15). The major hypothesis for the real-time-gamebased alert system is the following: The action of anticipation cannot be distinguished from the person’s perception of the anticipated (Nadin, 2005). This is especially important when dealing with extreme events in nature—earthquakes, hurricanes, tornados, etc.—and the associated actions that people initiate: for example, how they act when they become part of the extreme event. The game as a story line in the tradition of action and adventure games can be applied here. It has a learning monitoring function because the player is supposed to learn features pertinent to the environment (street configurations, access to help facilities, and difficult to handle natural features, such as brooks that might suddenly swell with water, etc.). Instead of the traditional Japanese approach of training for earthquakes, the game makes players feel familiar with their environment, but also aware of possible dangers (for example: What happens if the levees break? What if a tree falls? What if the roof blows off?). The game is connected to the Internet and receives real-time meteorological data, as well as input from the players themselves (this is a distributed, multiplayer game). As conditions require, the game becomes an alert system: “Go immediately to the tornado shelter.” For the aging, the game provides connections to community support groups that will assist the individual or deploy help, as the situation requires. Play, in such cases, is preparation for real situations, i.e., life under extreme event conditions. This particular development aims to integrate real-time data of an extreme event in a game environment. “Playing” an ongoing event tests and improves a person’s anticipation capabilities before they become a matter of life and death. Performance that relies on reaction only was shown to fail under extreme conditions. Therefore, in maintaining anticipatory characteristics, the game increases survival chances, especially for those senior adults who otherwise end up confused, or even ignored in the context of drastic events. The passing of time can put pressure on senior adults. Their game proficiency can be severely tested. But if in games of racing cars or shooting everything that moves only the score is affected, in our game survival is at stake. Therefore we had to develop a metaphor that connects the time in the game to the time in the world outside. 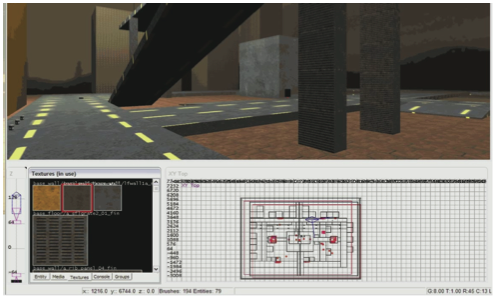 Richard Gray, aka Levelord, the well-known level design artist, helped the students involved in the project in addressing this concrete objective. Related to this development is the use of games for unobtrusive monitoring of the health condition of senior adults (living independently or even in retirement communities). Patterns of interaction between a player and a networked game are very telling in respect to cognitive performance and motoric skills. When the “game” detects deterioration in performance, it can alert medical centers for further evaluation and eventual remedy. Finally, from the games for health focused on aging, a new approach developed in respect to post-traumatic stress disorder (PTSD). PTSD has been fully documented in young and old, in male and female, in all races. The major observation guiding the research is that PTSD entails diminished anticipation. Anatomical changes (Brenner et al, 1995) point to reduced hippocampal volume, and thus explain the decline in anticipation. In addition, processes pertinent to preparation of movement or anticipation of upcoming stimuli are severely inhibited. Consequently, performance is either reduced or rendered impossible. We build on expertise acquired in defining the Anticipatory Profile, and from this we derived an integrated PTSD profile. It represents the multiple correlations among sensory data and motion descriptions focused on the specific symptoms of post-traumatic experiences. But what is relevant to game development is the ability to map from the PTSD profile to games that could assist individuals afflicted by traumatic experiences in recovering some of their adaptive capabilities. One particular project focused on aspects of PTSD associated with the events of 9/11. In short, Carolina Dabbah pursued the path of a virtual reconstruction of the traumatic event. Exposing subjects affected by PTSD to a virtual reconstruction—the game of “What if?”—(obviously under supervision, so as to avoid further trauma) resulted in progressive increase in movement preparation in anticipation of stimuli associated with explosions, fire, building collapse, etc. The findings are still in a preliminary phase. Such games, like all others conceived in the framework of project Seneludens, require a high degree of individualization. The traumatic event needs to be reconstructed for each subject. As a final note: Currently, Sheri Segovia, a Ph.D. candidate in the Humanities, and Catherine Turocy are in the process of generalizing from the experience spelled out in this study to a new category of games in which learning to dance is associated with the benefits of dancing. The two authors define Digi-Dance as an interactive video game involving full-body, real-time motion capture and the creation of digital agents as dance teachers, and even as dance partners. It reinvents the role of social dance in everyday life by joining player-avatars in a Wi-Fi-enabled environment sharing a library of selected dances (from the 16th century to the present). Through the ages, dance can be viewed as the original social network. The aging (but not only) face the progressive loss of such a network. Digi-Dance offers the possibility to build new social networks. Therefore, it can contribute as well to the maintenance of adaptive performance of senior adults. With light-weight, attachable motion sensing controls, players learn dance steps and patterns demonstrated by a digital teacher, while seeing their own movement on screen in avatar form. A dance can be enjoyed solo (as in the Shim Sham or a Clog), with a digital partner (as in a minuet or a tango), or with a Wi-Fi-enabled group (as in a Texas line dance or a Cotillion). Besides simply spreading the joy of dancing, Digi-Dance inspires creativity and fitness by providing physical and mental challenges, and a somatic experience that can address the physiological effects of depression. It also prolongs mental sharpness. Casual dance involves brain activity in rapid decisionmaking, as well as memorization of sequence. Digi-Dance is accessible to all ages, independent of language, and is culturally inclusive. With its breadth of dance genres, it will likely encourage cultural and social interaction. Adults struggling with depression and/or the physiological effects of aging would have a self-directed activity in their own home that is physically and mentally beneficial. In addition, interaction with children and grandchildren is facilitated through a gaming experience that can be rewarding to all. Last but not least, games that “turn back the clock” of aging through maintenance and possible enhancement of anticipatory characteristics will add a new field of broad social and commercial significance to the economy. Based on market estimates (cf. Kaiser Permanente Foundation), by 2025 the share of the population age 65 and above will reach 22%, up from 12% in 2000. This translates into a dollar amount requested for addressing the needs of the aging population in the range of 8-10 trillion dollars (included here are Social Security, Medicare, additional medical insurance costs, drugs, various forms of therapy, medical care, homes for the aged, etc.). Individuals—old and young—and society at large should benefit from the research presented herein. For each lifespan that an individual gains, his/her younger family members will be able to provide affectionate support, unburdened by expensive and time-consuming care and physical assistance. Society would save the money currently spent on addressing the needs of the aging (drugs, therapy, assisted living). As we know too well, some of the aged end up abandoned by family members. Others, for reasons beyond their control, have no recourse to family support. Society would also benefit from the behavioral therapy implicit in game-supported maintenance of skills and the learning it entails. The knowledge accumulated through games can only add to the lives of individuals who are rich in experience, but getting poorer, as they get older, in respect to their physical and cognitive faculties. This late-in-life knowledge will in many ways reward a society that makes life-long learning a priority across generations. 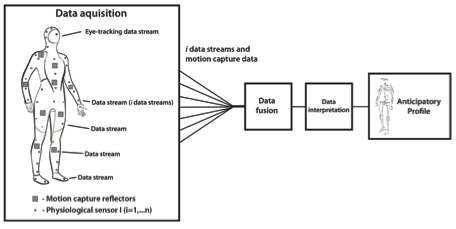 An integrated mobile wireless system for capturing physiological data streams during a cognitive- motor task: Applications for aging. (2007, November 11-12). In IEEE Engineering in Medicine and Biology Workshop, IEEE Dallas University of Texas at Dallas, (pp. 67-70). Analyzing Motoric and Physiological Data in Describing Upper Extremity Movement in the Aged (with G.N. Pradhan, N. Engineer, B. Prabhakaran). (2008, July 16-19). In International Conference on Pervasive Technologies Related to Assistive Environments (PETRA 2008), ACM International Conference Proceeding Series, Athens, Greece, (Vol. 282, pp.8). Bremner, J., Randall, R., Scott, T., Bronen, R., Seibyl, J., & Southwick, S. (1995). MRI-based measurement of hippocampal volume in patients with combat-related posttraumatic stress disorder. The American Journal of Psychiatry, 152, 973–981. Clark, J. E., Lanphear, A. K., & Riddick, C. C. (1987). The effects of video game playing on the response selection of elderly adults. Journal of Gerontology, 42(1), 82–85. Cohen, A. (2006). Video-Game Makers Discover New, Older, Market. NPR. Retrieved on November 17, 2008 from http://www.npr.org/templates/story/story.php?storyId=6589941. Da Vinci, L. (1498). Trattato della Pittura. Milan, Italy. Dinse, H. R. (2001). The Aging Brain. In N. Elsner & G.W. Kreutzberg (Eds. ), The Neurosciences at the turn of the century: Vol. 1. Proceedings of the 4th Meeting of the German Neuroscience Society, (pp. 356-363). Thieme: 28th Göttingen Neurobiology Conference. Gallese, V. (2001). The “Shared Manifold” Hypothesis. From Mirror Neurons to Empathy. Journal of Consciousness Studies, 5(7), 33–50. Integration of Motion Capture and EMG data for Classifying the Human Motions (with Balakrishnan Prabhakaran, Gaurav Pradhan, Navzer Engineer). (2007, April 17-20). In Proceedings of the IEEE 23rd International Conference on Data Engineering Workshops (pp. 56-63). Isselsteijn, W., Nap, H. H., deKort, Y., & Poels, K. (2007). Digital game design for elderly users. In Proceedings of the 2007 Conference on Future Play, Toronto, Canada (pp. 17-22). New York: ACM. Jaycox, K., & Hicks, K. (1976). Elders, Students, and Computer—A New Team (ISEAC No. 7). Urbana, IL: University of Illinois, Illinois Series on Educational Applications of Computers. Kawashima, R. (2003). Train Your Brain. Teaneck, NJ: Kumon Publishing Co.
Nadin, M. (1991). Mind—Anticipation and Chaos. Stuttgart, Germany: Belser Presse. Nadin, M. (2003). Anticipation—The end is where we start from. Basel, Switzerland: Lars Mueller Verlag. Nadin, M. (2004). Project Seneludens. Richardson, TX: University of Texas at Dallas, antÉ Institute for Research in Anticipatory Systems. Nadin, M. (2005). Anticipating Extreme Events – the need for faster-than-real-time models. In Extreme Events in Nature and Society, (Frontiers Collection). New York: Springer Verlag. Nicolelis, M. (2005). Neural Control of Artificial Limb Movement. Paper presented at the symposium: Reprogramming the Human Brain, April 2005, Dallas, TX. Rizzolati, G., Fadiga, L., Fogassi, L., & Gallese, V. (1999). Resonance behaviors and mirror neurons. Archives Italiennes de Biologie, 137, 83–99. Rosen, R. (1985). Anticipatory Systems. Philosophical, Mathematical and Methodological Foundations. Oxford, UK: Pergamon Press. Tully, T. (2005). From Genes to Drugs for Cognitive Dysfunction. Paper presented at the symposium: Reprogramming the Human Brain, April 2005, Dallas, TX. United Nations Programme on Ageing. (2002). Retrieved on November 5, 2008, from http://www.un.org/ageing/. Weisman, S. (1983). Computer Games for the Frail Elderly. The Gerontologist, 23(4), 361–363. Whitcomb, G. R. (1990). Computer Games for the Elderly. Symposium on Computers and the Quality of Life. In Proceedings of the Conference on Computers and the Quality of Life, George Washington University, Washington, DC, (pp. 112-115). New York: ACM SIGCAS.